The following is from the office of readings for today. 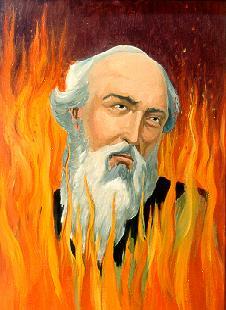 It is an excerpt from a letter by the Church of Smyrna on the martyrdom of St. Polycarp. Right before he was put to death, his executioners asked if he could give them anything that would prove he was not a follower of Christ. But he asserted, in clear terms, that he was just that: a follower of Christ. After 86 years, he was not about to renounce his faith in Christ. The letter ends by explaining what happened after St. Polycarp said this prayer. When he had said, “Amen” and finished the prayer, the officials at the pyre lit it. But, when a great flame burst out, those of us privileged to see it witnessed a strange and wonderful thing. Like a ship’s sail swelling in the wind, the flame became as it were a dome encircling the martyr’s body. Surrounded by the fire, his body was like bread that is baked, or gold and silver white-hot in a furnace, not like flesh that has been burnt. So sweet a fragrance came to us that it was like that of burning incense or some other costly and sweet-smelling gum. Br. Dominic quoted all this in his homily today. He said it’s fitting, because we ought to be ironing out the dough that is our lives–that is, getting rid of all the air pockets–as Lent approaches so that when we come out of the oven at Easter, we are nothing like as we used to be. It’s the little ingredients that count. Br. Dominic said that as he was a kid, he was always jealous of the martyrs, because they only had to stick up for the faith once when everybody was watching. Whereas he had to do it every day. But what he realized later is that it was all those years of sticking up for the faith that enabled them to stick up for it bigtime, at martyrdom. It’s the little ingredients that really make the Christian life. This entry was posted in Lent, Liturgy, Prayer, Reflections, Saint Quotes, Saints. Bookmark the permalink.